I was recently introduced to glamping at Utah's Conestoga Ranch, just a short jaunt from Bear Lake. If you're not hip to the term—I wasn't—"glamping" is glamour camping. The answer to the website's FAQ "What does my family need to pack for our Conestoga Ranch adventure?" pretty much sums things up: "Pack as though you were staying at a luxury lakeside resort—because you are." The accommodations at Conestoga Ranch range from luxurious, semipermanent tents (not your typical two-person Coleman affair) to Conestoga wagons that sleep from two to eight people, depending upon the configuration. We had a big tent with four twin beds in one room and a queen bed in the other, plus a toilet, shower, sink, free Wi-Fi, electricity, heaters and such. As my wife said, "This is my kind of camping!" The tents and wagons are perched on a hill with terrific views of Bear Lake and beyond, and I can't imagine a better base camp from which to enjoy Garden City's Raspberry Days and the final weeks of summer in and around Bear Lake. I was visiting Conestoga Ranch not only to luxuriate in its top-notch accommodations, but to check out the ranch's new restaurant, Campfire Grill. The restaurant itself is a large timber-framed, tented space, which opens up in nice weather to let the outdoors in—al fresco dining at its finest. You needn't be a guest at Conestoga Ranch to dine at Campfire Grill; the public is invited to enjoy lunch and dinner daily, and breakfast on weekends. In addition to indoor and open-air tables, there's counter seating where you can enjoy watching artisan pizzas being cooked in the wood-burning oven. The first surprise I encountered at Campfire Grill was the price list. For such an upscale facility, the menu prices are very fair. Two eggs with bacon or sausage and toast at breakfast is a mere $6.95. Buttermilk pancakes are $5.95 and a toasted English muffin is only $1.50. During lunch, wood-fired pizzas run $9.95 to $12.95, the latter for a prosciutto and arugula pizza with garlic Béchamel and fresh mozzarella. There are salads, a kids menu, soup and appetizers, too. But the Campfire Grill really shines in the evening, when the full dinner menu is available. The pizzas, burgers and salads are still evening options, but the main dishes stand out—plus a lean, but well-chosen, beer and wine selection. The smallish wine list is particularly justified given the seasonal nature of Conestoga Ranch; it's not a place that can keep a fully stocked, year-round wine cellar. A bottle from the wine list of GSM Hahn red wine ($30), for example, is very versatile, and pairs well with flavors ranging from fire-roasted chicken wings or the Conestoga Ranch Burger ($10.95), to pepperoni pizza with soppressata ($11.95) and the Angus rib-eye steak frites. Chef Gustavo Suclla Schiaffino sources his beef from Bear Lake Beef Co., which, I wasn't familiar with. It produces Wagyu beef that is out of this world in terms of tenderness and flavor. As we settled in for dinner, we were treated to an amuse-bouche of steak tartare with avocado, baby asparagus, crostini, micro greens, sliced radish and perfectly spaced dollops of citrus truffle vinaigrette. What a glamorous beginning to a glamping dinner. I really liked the fire-roasted chicken wings with homemade apple barbecue sauce. But since I was pacing myself, my son Hank inhaled most of them. The sauce was nicely sweet and tangy. The dish presentation, however, left a bit to be desired, especially after the beautiful amuse-bouche that preceded it. The sliced celery and carrots were unadorned and looked like they might have come pre-sliced straight from a bag. By contrast, a plate of pan-seared fresh Atlantic salmon ($17.95) was lovely to look at. 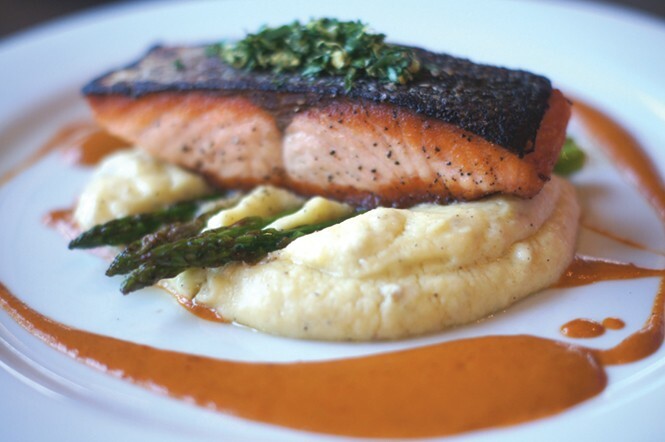 The perfectly cooked, medium-rare salmon was plated atop a bed of puréed potatoes, with spears of charred asparagus poking out underneath, gremolata on top of the salmon and a swish of tomato beurre monte—a very clever way to finish the dish. Campfire Grill Mac & Cheese ($9.95) is far from routine. For starters, it's not made with macaroni, but rather with fresh-made campanelle in a silky white cheddar, smoked gouda and provolone sauce, garnished with a crisp-fried slice of coppa. It's glam mac & cheese. The wood-roasted half-chicken I ordered was presented in quarters, stacked on a bed of roasted fingerling potatoes, encircled with zippy Tuscan cherry tomatoes—a real balancing act. While the dish, in general, was quite good, the chicken was slightly overcooked and a little tough in places. Still, priced at a mere $14.95, it's a dish I'd try a second time. I would never hesitate to return for the Conestoga Steak Frites ($24.95). This was a gorgeous, 1-pound Angus rib-eye steak cooked medium rare with béarnaise sauce and excellent Parmesan-dusted french fries. The steak was so tender and juicy—one of the best pieces of meat I've tasted in a long time. Service at Campfire Grill is very friendly, and manager/consultant Michael Krulin roams the dining room making sure everything is perfect and everyone is happy. And how could you not be, ensconced in Bear Lake's best dining destination. For dessert, it's a no-brainer to enjoy the raspberry crème brulee. You are eating in the raspberry capital of the universe, after all. The best way to end a day of Conestoga Ranch glamping? Why, making s'mores with new friends at the communal campfire—or toasting marshmallows under the stars at your private one, of course.